This is the best Rom I've ever used, but there are a few bugs that seem to be in every MIUI Rom I've tried. I'm using the TMOUS HD2. 1. The spinner for setting date and time doesn't work with Profile Valet or Profile Manager. Both can be found in Android market. Also, the spinner is not so polished like other parts of MIUI which are wonderful. 2. There are two iphone themes. Both of them cause the same problem. Once I load those themes, I can no longer access System settings. It crashes every time. This also happens across a range of MIUI Roms. 3. The MIUI Gallery which is wonderful, crashes when I tried to "edit" a picture on the particular rom I'm using. It worked before, but on this rom, it's crashing every time. 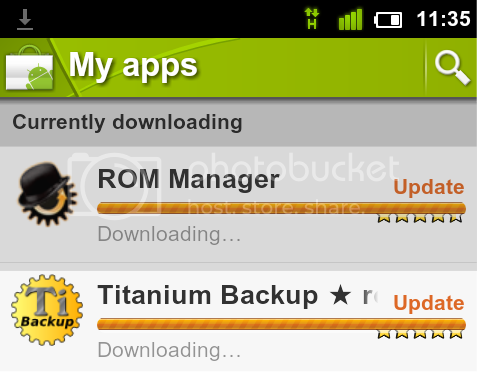 The rom is "JW MIUI-26April.zip"
Thanks for the great roms though. This is the best rom series ever. 1. Could you provide a screenshot so it can be reported. 1. Phone crashes when receiving a call while watching a flash video. 2. Music force closes sometimes. 3. Downloading files greater than 100 mb, crashes if multitasking. Something to note, camcorder is laggy, but Jan from xda fixed it on his build. Not sure if this has been mentioned already but when downloading an update from the Market the progress bar cuts across the rating. It doesn't really affect the download, but hoping it is a general issue and not just me. Mark I have been having this problem from the last two releases. Whenever I cleared my memory via App Killer (long press home and App Killer). After about 30mins two things will happen. 2.pull down menu gets wonky without drawing the background. Attached is the screen shot of this occurrence.